Ahead of Small Business Saturday (December 1st) we announced that two thirds of dog owners will splash out on a thoughtful gift for their pet pooch this Christmas. Shoppers told us they like the quality of service and personal attention their pup receives when shopping at local businesses. 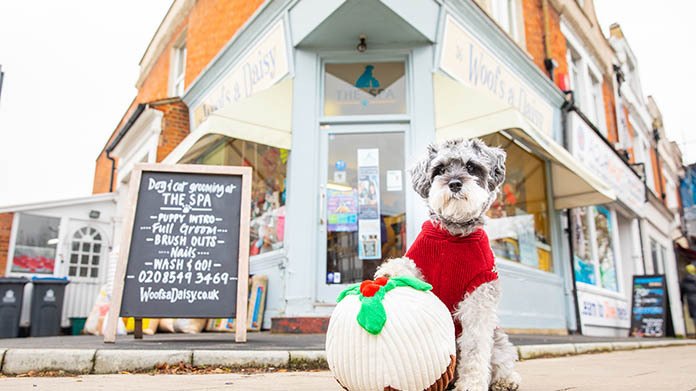 One such small business that has benefitted from this “Pooch Pound” boom is Woofs A Daisy in Kingston, so we headed down to capture some adorable photos of puppy present time. The I and the Daily Mail lapped up the story, and the latter article was talked about on the Sky News Press Preview segment. More followed from the Sun Online, Evening Standard picture of the day and an abundance of trades from Pet Gazette to the Retail Bulletin. It also inspired Jeremy Vine to give a dog a gift live on air and dedicate a segment of his show on FIVE to discussing whether this is a bone-a-fide trend.